In this colorized image of a brain cell from a person with Alzheimer's, the red tangle in the yellow cell body is a toxic tangle of misfolded "tau" proteins, adjacent to the cell's green nucleus. 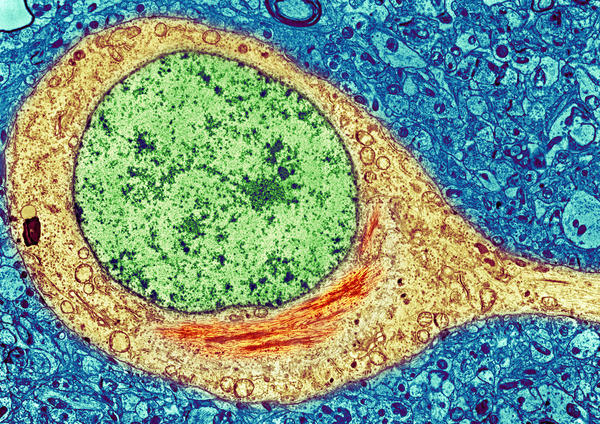 Efforts to find a treatment for Alzheimer's disease have been disappointing so far. But there's a new generation of drugs in the works that researchers think might help not only Alzheimer's patients, but also people with Parkinson's disease and other brain disorders. Previous efforts to treat Alzheimer's have focused on a single target — usually the protein called beta-amyloid, says Maria Carrillo, chief science officer of the Alzheimer's Association. "The one-target approach is probably not going to be the answer," Carrillo says. Instead, several teams of scientists reporting their work at the Alzheimer's Association International Conference in Washington, D.C., this week are targeting a process in the brain that leads to toxins involved in several different diseases. The biotechnology company Treventis is working on one of these potential drugs. "Our ultimate goal is to discover a pill that can be taken once a day that could either stop or slow Alzheimer's disease," says Marcia Taylor, the company's director of biological research. Treventis hopes to do that with a drug that prevents the build-up of two toxic proteins. These toxic substances, called beta-amyloid and tau, are the result of a process that begins when a healthy protein inside a brain cell somehow gets folded into the wrong shape. "Sometimes it gets what I call a kink," Taylor says. Then, when the misfolded protein meets another protein floating around in the cell, "It kind of grabs onto that protein and they both kink up together," she says. That can trigger a chain reaction that produces clumps of misfolded beta-amyloid and tau proteins that damage brain cells. "And our compound — because it targets protein misfolding — is actually able to prevent both beta-amyloid and tau from making these clumps," Taylor says. The compound works in a test tube and is currently being tested in animals, she says. Another potential new treatment could help people with Parkinson's and a disease called Lewy body dementia, as well as those with Alzheimer's. Previous efforts to treat those diseases have focused on differences in the proteins thought to cause them, says Fernando Goni of New York University. "So what we said is, 'Do they have something in common?' "
The common element is proteins that misfold and then form toxic clumps. Goni and his colleagues decided to go after these clumps, without worrying about which protein they contain. The result is a class of monoclonal antibodies that work like guided missiles to find and neutralize protein clumps in brain cells. Previous experiments showed that the monoclonal antibodies work on the tau and amyloid clumps associated with Alzheimer's. Studies in mice show that the treatment can reverse symptoms of the disease, Goni says. "We took animals that already had the disease and we infused them with the monoclonals and after a couple of months they were almost as perfect as the normal mice of that age," he says. Goni also presented evidence at the meeting that these targeted antibodies work on clumps associated with Parkinson's disease and Lewy body dementia, too. Perhaps the most unusual potential new treatment for Alzheimer's comes from Neurophage Pharmaceuticals, a company that owes its existence to an accidental discovery. A few years ago, Beka Solomon, a researcher in microbiology and biotechnology at Tel Aviv University in Israel, realized that a virus she was using for another purpose seemed to reverse Alzheimer's in mice. So she continued to study the virus, says Richard Fisher, the chief scientific officer of Neurophage. "Meanwhile, her son, who had just spent 10 years in Israeli special forces, goes to Harvard Business School," Fisher says. "He needs a project. And he and another colleague at the business school put together a potential company based on [his mother's] discovery." In 2008, that potential company became Neurophage. "I was the first employee and I thought, 'Wow, this is really crazy,' " Fisher says. But it wasn't. Scientists were able to figure out how the virus was attacking Alzheimer's plaques and use that information to create a treatment. And in mice, that treatment appears to work against both Alzheimer's and Parkinson's, Fisher says. The company plans to begin testing its treatment in people in early 2016. Efforts to find a treatment for Alzheimer's disease have been disappointing so far, but researchers are working on a new generation of drugs that take a different approach. NPR's Jon Hamilton reports on research presented at the Alzheimer's Association International Conference in Washington, D.C.
JON HAMILTON, BYLINE: The new approach is to interrupt a process that leads not only to Alzheimer's, but to other brain diseases. Marcia Taylor is a researcher at Treventis, one of the companies working on next-generation treatments. MARCIA TAYLOR: Our ultimate goal is to discover a pill that can be taken once a day that could either stop or slow Alzheimer's disease. HAMILTON: Treventis hopes to do that with a drug that intervenes early in the disease process. Taylor says Alzheimer's begins when a protein molecule inside a brain cell somehow gets folded into the wrong shape. TAYLOR: So it's normally floating around in the cell, and sometimes it gets what I call a kink. TAYLOR: It kind of grabs on to that protein, and they both kink up together. HAMILTON: This can lead to a chain reaction that produces clumps of misfolded proteins, and these clumps are toxic to brain cells. Taylor says in Alzheimer's, there are two different proteins that misfold. They are called beta-amyloid and tau. TAYLOR: And our compound, because it targets proteins misfolding, is actually able to prevent both beta-amyloid and tau from making these clumps. HAMILTON: In a test tube, at least. Taylor's says animal testing is underway. Another potential new treatment could help people with Parkinson's and a condition called Lewy body dementia, as well as those with Alzheimer's. Fernando Goni of New York University says previous efforts to treat those diseases have focused on the differences in the proteins thought to cause them. FERNANDO GONI: So instead of trying to see, oh, what is so particular about this, what we say is do they have something in common? Because, in a way, they suffer a transformation that has some similarities. HAMILTON: In each disease, proteins misfold and form toxic clumps. So Goni and his colleagues decided to go after these clumps without worrying about which misfolded proteins they contain. The result is monoclonal antibodies that work like guided missiles to find and neutralize the protein clumps in brain cells. Previous experiments showed that the monoclonal antibodies work on the clumps associated with Alzheimer's. And at the Alzheimer's meeting, Goni presented evidence that the antibodies also work on clumps associated with Parkinson's disease and Lewy body dementia. Goni says the treatment can even reverse the effects of advanced Alzheimer's in mice. GONI: We took animals that already had the disease, and we infused them with the monoclonals. And after a couple of months, they were almost as perfect as in normal mice of that age. HAMILTON: Perhaps the most unusual new drug comes from a company that owes its existence to an accidental discovery. RICHARD FISHER: What we have is something that was completely serendipitous. HAMILTON: Richard Fisher is the chief scientific officer of Neurophage Pharmaceuticals. He says a few years ago, a scientist in Israel realized that a virus she was using for another purpose seemed to reverse Alzheimer's in mice. So, Fisher says, she kept studying this virus. FISHER: Meanwhile, her son who had just spent 10 years in Israeli Special Forces goes to Harvard Business School. He needs a project, and he and another colleague at the business school put together a potential company based on this. HAMILTON: Fisher says that potential company became Neurophage. FISHER: I was the first employee, and I thought, wow, this is really crazy. HAMILTON: But it wasn't. Scientists were able to figure out how the virus was attacking Alzheimer's plaques and used that information to create a treatment. Fisher says it works on a wide range of misfolded proteins, but the first studies of its effectiveness in people will involve patients with Alzheimer's. He says the goal is to show that the treatment reduces those clumps of tau and beta-amyloid protein. FISHER: Once we show that, we can go into, for example, Parkinson's disease. HAMILTON: And attack a different misfolded protein. Jon Hamilton, NPR News. Transcript provided by NPR, Copyright NPR.